The whirlwind that is the National Genealogical Society conference is blowing strong in Las Vegas this week and it’s left many of us — The Legal Genealogist included — breathless. The sheer number of sessions, the variety of speakers, the excitement of the vendor hall, the opportunity to spend time with old friends and meet new ones is exhilarating but wow… no time to even think!!! I had the chance on Wednesday to hear the keynote address from the very entertaining and very knowledgeable Marian L. Smith. 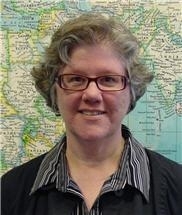 Marian is Chief of the USCIS Historical Research Branch and directs the agency’s History Office, Historical Reference Library, and Genealogy Program. She’s been the nation’s immigration historian for nearly 25 years and if there’s anything about U.S. immigration and naturalization that she doesn’t know, it probably isn’t knowable. She is also one of the best speakers out there on genealogical topics. I’ve had a blast so far telling some of those stories in my own presentations Wednesday on The Treasure Trove in Legislative Petitions and yesterday in Blackguards and Black Sheep: The Lighter Side of the Law. One more to go on Saturday, with How Knowing the Law Makes Us Better Genealogists. Thanks so much for sharing some of the things you learned at the conference. I appreciate it.